Welcome to my Creative Tools ! - Addons and presets for Adobe products. Designed with digital painters in mind, these tools aim to give traditional and concept artists access to workflow environments they're used to in other packages. Photoshop is often seen as being focused on photo manipulators, but it's also the main program for digital painters and needs some love there too I think. ..A smart palette/swatch system that changes intelligently to keep you in the flow. An entirely new panel based on the tech of the fabulously received Dynamic Swatches series. 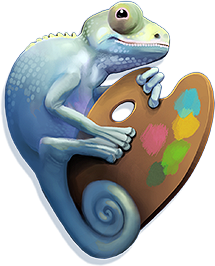 Chameleon Palette is a single panel that changes according to your needs. Feature rich and CPU light (it takes no resources while painting) it does everything the Dynamic Swatches did and more. All, again, in one incredibly flexible panel. When you're painting and you just want a color picker, not a spaceship control panel, have you ever wished there was one that was elegantly ARTIST-orientated? One that didn't require multiple clicks just to leave the panel that you obviously already chose ?. One that then gets the hell out of your face ? ..meet RH Hover Color Picker! Dynamic Palette is aimed squarely at Professional Colorists. With the input of many outstanding comic book Colorists from around the world, this extension facilitates custom ranges of user defined palettes with LightGel and Gradient features included. All marked current extensions are fully compatible with Adobe Photoshop CC 2017 and above, utilizing and leveraging the very latest API. For any issues please feel free to visit the FAQ before emailing.